This past Monday (September 18), we joined Barnes & Noble Millbury for their monthly family game night. We got to play several brand-new games and meet more family gamers. We had a great time! 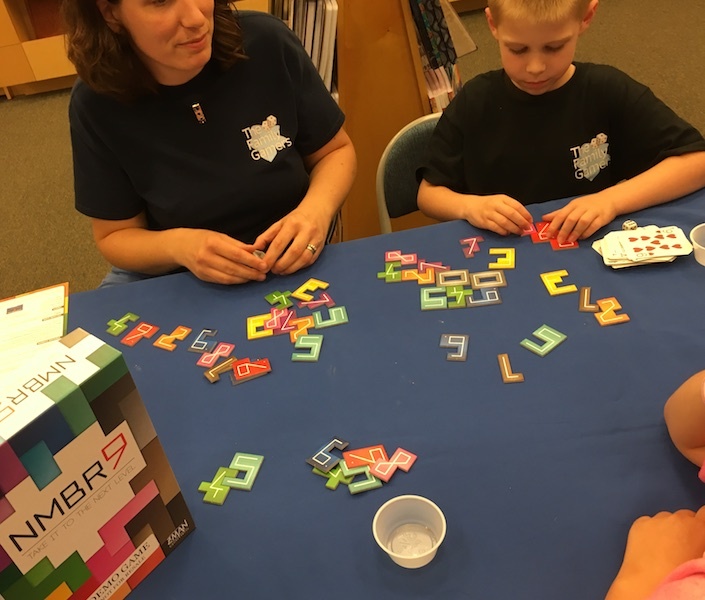 Anitra loved NMBR 9, an abstract game from Abacus Spiele and localized to the United States by Z-Man Games. Each player creates a multi-layered mosaic from pixelated number tiles. Numbers placed on higher levels must overlap at least 2 numbers beneath, but cannot overhang any empty space. The bottom layer is worth zero points, the next is worth the face value of the numbers, the next layer is worth twice the face value, and so on. The strategy is to build a large enough base and minimize holes so that numbers can be built as tall as possible. Andrew started off the night with Magic Maze, a 2017 Spiel des Jahres nominee from Sit Down! Games, localized to the United States by Dude Games. Magic Maze is a co-operative game played in real time. Each player can move any of the 4 pawns whenever they want – but only with the specific action(s) assigned to that player. Players cannot directly communicate with each other once the game begins. However our groups were having so much fun, they couldn’t stay quiet! The last game of the night was Downforce, from Restoration Games. Corey, who writes for The Family Gamers, was the most excited for this game (expect a review soon). In Downforce, players buy cars and bet on the race even as it they push cars ahead by playing speed cards and special powers. 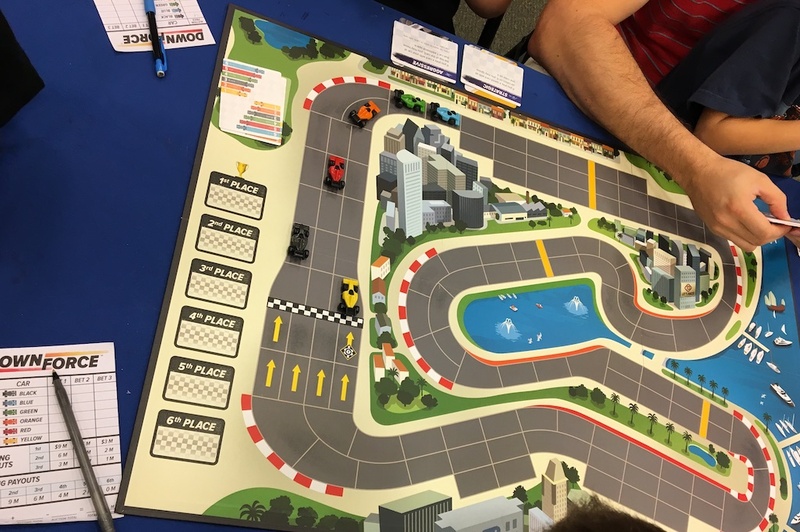 As with most games by Restoration Games, Downforce is a remake of a classic, in this case the Milton Bradley game Daytona 500, which itself was a remake of Top Race. If you liked the popular race bidding game Camel Up, but want a little less chance involved in your play, check it out! We loved playing all of these games and we look forward to co-hosting the next game night. These game nights are wonderful ways to learn about brand new games just hitting shelves, without the pressure to buy. And if you get lucky, the staff at the Barnes and Noble café will bring you free samples! If you want to learn more, head over to the Millbury Barnes and Noble Facebook Page! We also talk a bit about these games in Episode 64 of The Family Gamers Podcast. What have you played this week that everyone should know about? Tell us in the comments or in our Facebook community! We look forward to hearing from you! Thanks, Stefany. We’re looking forward to playing with you again!